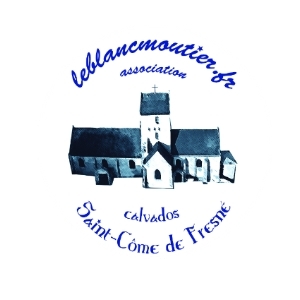 the valorization and the animation of the church of Saint-Côme de Fresné. This proverb, remind us that the bell tower painted in white was a landmark for the seamen. 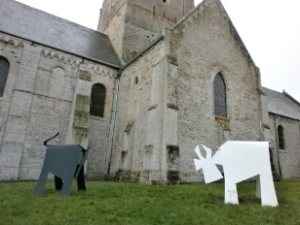 The origin of the church dedicated to St Côme and St Damien goes back as far as the 12th century. It remains to-day only the North and West wall and the East part of the nave, the openings of which were transformed during the 18een century. The choir has been transformed during the 15th century with the construction of the bell tower (the windows are from the 16th). In 1878 & 1879 are added Notre-Dame du Mont Carmel, Notre-Dame de Lourdes and Marthe-Mary, the 3 bells of the carillon. 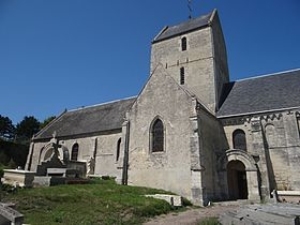 On June 6th 1944, Le Blanc Moutier, despite being damaged by the artillery, is the first to announce the landing of the allied forces, as reminds an inscription on the wall of the sacristy. The scenic road does not exist yet and the troops landing via the East wharf of Mulberry went by the foot of the church. What are the damages ? Two studies conducted by experts, in 2009 and 2010, gave an accurate view of the damages at the level of the stonework of the bell tower and of the whole framework of the roof. At the level of the stonework, captors installed in 1995 cracked (from a few millimeters up to 15 millimeters).13 steps of the staircase are fractured (further more they are all of them worn out). The pillars, the vault and the bell tower are distorted and cracked. Further more, repairs made sometimes a long time ago, demonstrate that the structure has always been unstable. The framework of the roof (or to be more accurate the 5) is mainly in oak (Choir and nave) reinforced or repaired with pine. (pine wood is dominant for the transepts and the bell tower, reminders of 1944). Most of the pieces are attacked by worms and some joints are defective or even broken! The roofing and the walls are soaked in by water. Then it will be necessary to readjust as pre-work, the foundations or alternatively to reinforce the soil. After, will come the strengthening of the building itself: clutch the walls, install a belt around the bell tower, to stitch the arches and the stairs. A proposed process would be to insert glass fibers in the elements. The framework of the roof will be freed of the dead and broken pieces. As a second step, it will be chemically treated and the pieces broken or too weak will be replaced. Obviously, the roofing, now at its end of life, will have to be renewed. The civil works and preparatory studies prior to execution amount in total of 904 000 Euros! Local collectivities are unable to finance the whole project, our association, « Le Blanc Moutier », must collect funds to complement. We need your help. Thank in advance.